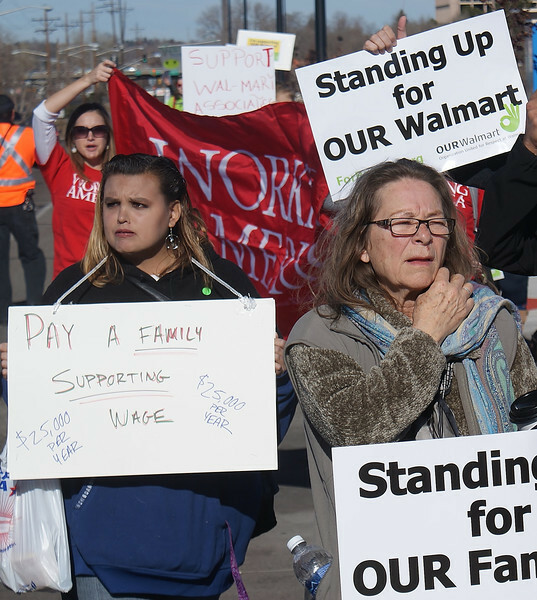 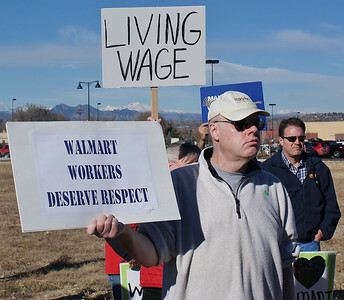 Protesters from unions and community groups rallied and marched outside a Walmart in suburban Denver, to demonstrate against the companies low wages and mistreatment of their workers. 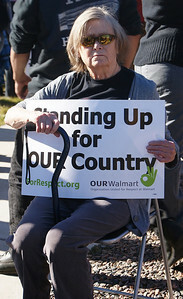 This senior was among Black Friday protesters outside a Walmart store, objecting to the compamies mistreatment of their workers. 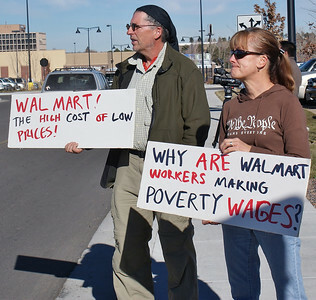 The low wages paid to workers, were an issue for many people at a Black Friday protest in front of a Walmart near Denver, Co. 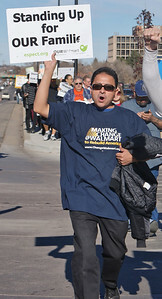 The effect of low wages on workers and their families, was a concern for this man at a Black Friday protest in front of a Walmart in suburban Denver, Co. 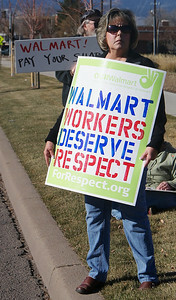 Respect for the rights of workers, was a concern of this protester marching near a Walmart store in suburban Denver, Co., on Black Friday. 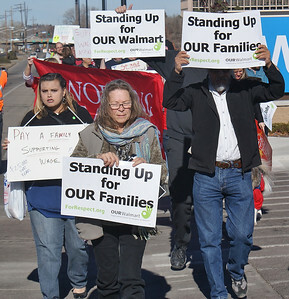 The effect of low wages on workers and their families, was a concern for these marchers at a Black Friday protest in front of a Walmart in suburban Denver, Co. 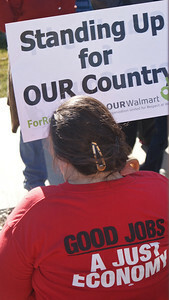 This woman at a Black Friday Walmart protest calls on the company to pay it's workers a minimum wage of $25,000 per year. 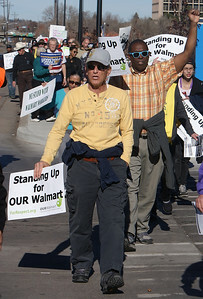 The effect of low wage jobs on the US economy was an issue for this woman at a Black Friday protest in front of a Walmart in suburban Denver, Co. 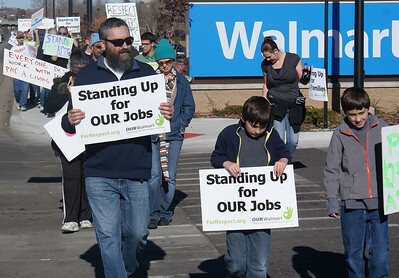 This father and two young sons, joined a Black Frday protest at a Walmart store in suburban Denver. 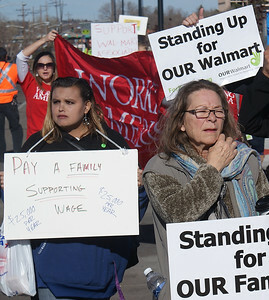 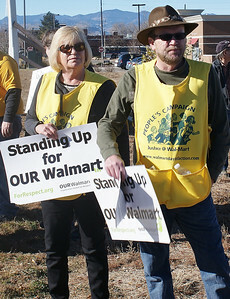 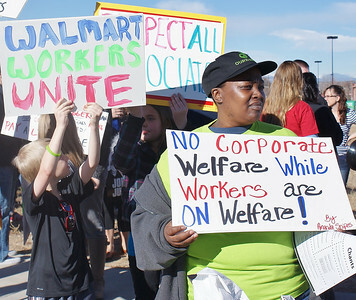 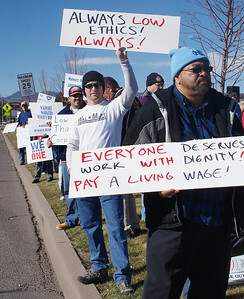 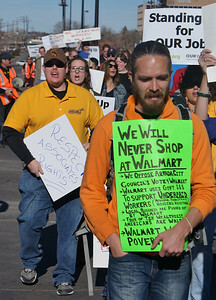 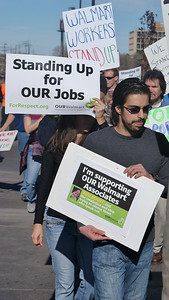 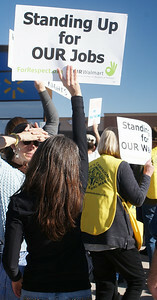 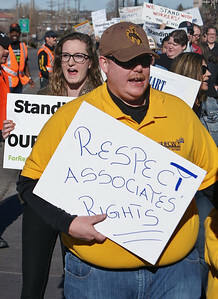 Protesters from unions and community groups line the street outside a Walmart in suburban Denver, to demonstrate against the companies low wages and mistreatment of their workers. 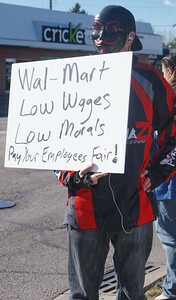 Black Friday protester, wearing an "annonymous" mask, objects to Walmart's low wages. 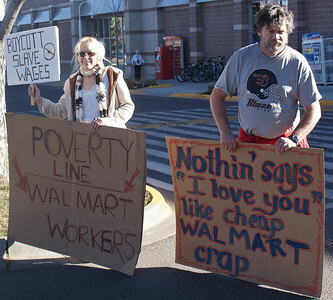 Black Friday protesters outside a Walmart store object to the companies low wages. 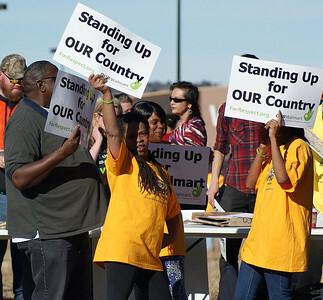 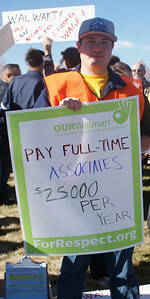 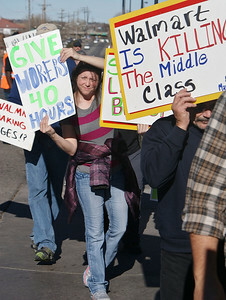 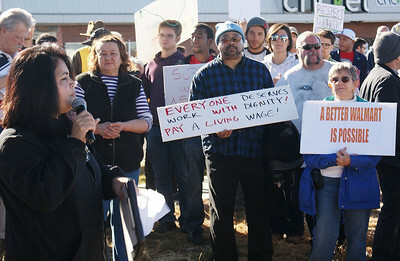 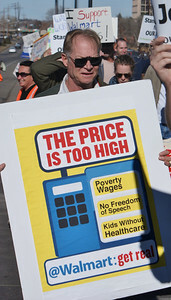 The effect of low wage jobs on the US economy was an issue for many people at a Black Friday protest in front of a Walmart in suburban Denver, Co. 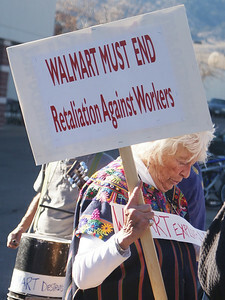 This woman addresses a Black Friday rally for better wages and workers rights, in front of a Walmart in suburban Denver, Co.
Demonstrators rallied and marched outside a Walmart store on Black Friday, to protest the companies low wages and mistreatment of their workers. 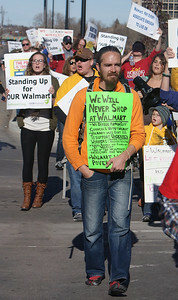 Black Friday protester vows not to shop at Walmart due to the companies low wages and mistreatment of it's workers. 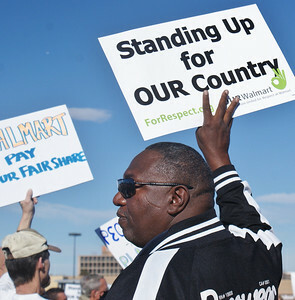 Low wages and lack of health care were issues for this man at a Black Friday protest at a Denver area Walmart. 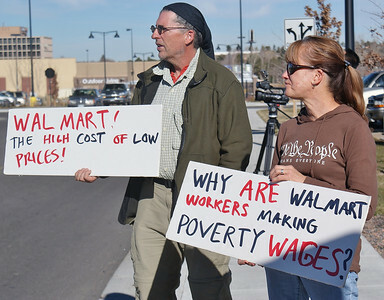 Poverty level wages and "cheap products" were issues for these protesters outside a Walmart store in Boulder, Co. on Black Friday.